It has been quite a while since Pacific Gravity has done a traditional Big Brew event and the natives were getting restless! So much so that Neil Saund and John Hilliard couldn’t wait for the official 10:00 AM start time. Both were nearing strike temperature as the hour rolled around. Especially impressive, given that Neil lugged in not only his brew setup, but also a dozen gallons of distilled water to make surehis Czech Pilsner had the correct mineral balance. Being happy with the native sulfate to accentuate the Citra hops, John went right to work with some carbon-filtered LA aqueduct to brew his Pale Ale. In the meantime, Carl went to work making sure both Shark and Mermaid were ready to slake the thirst of both brewers and spectators alike. Much to the delight of the early-birds, coffee and donuts arrived at 10AM thanks to the efforts of Michael and Tania Musgrave, our Veep and Secretary. They were eagerly wolfed down, maybe with a bit of coffee porter to ease us into the late-morning swing. With a spark and a roar, Carl fired up the amazing thermosiphon reboiler to brew his commemorative 25th Brewing Anniversary Belgian Quad. 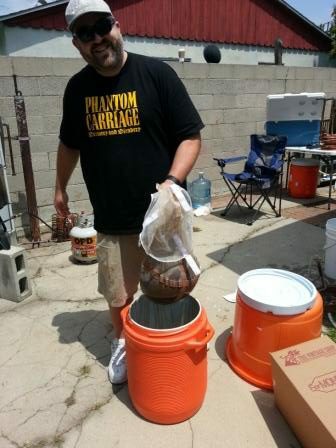 Shortly thereafter, Brian Holter stepped up to the plate to demonstrate the “brew-in-a-bag” technique. Not really sure how much heat the nylon bag could take, Brian eased into the kettle gently until he was sure his mash temperature had been met. Michael then kicked off his mash making a mini Belgian Tripel. He was followed by Tim Bardet with an extract version of American Hoppy Brown. Last, but definitely not least, Ian Fraser showed up with a big jar of honey that would make Winnie-the-Pooh happy and set about making mead. In the meantime, more and more spectators arrived and were amazed at the size and diversity of brewing set-ups and mashing techniques. Brewers carefully explained the enzyme action needed to convert starch into sugar, hopefully prompting them to jump into the all-grain fray. Additional beer donators were also arriving and hooking up the fruits of their earlier brewing triumphs. The shark and mermaid were quickly at capacity, and reinforcements were “jockeyed’ into action. 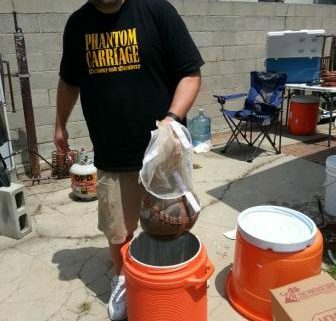 To fill out the field, many bottles of exotic fermentation, both commercial and homebrew showed up as well. All this brewing had everyone working up an appetite, so President Lloyd stepped into action at the barbeque grill. Aided by the adept slicing skills of Tania, a bevy of burgers and dogs soon hit the lunch plates with all the accoutrements. It has been said the last shall be first, and Ian proved that to be true with a quick completion of his mead. Not only that, but he took the record for starting gravity for the day, at about 1.130! The rest of the brew crews finished up roughly in reverse order of their starting times. Carl’s hop garden, artichokes and tomatoes got plenty of water that day as the seven batches of wort approached their pitching temperature. As the sun was setting in the west, all the brewers commented that the brew session went well. The various yeast starters got their reward next, as they got down to the real business of converting maltose into ethanol. All in all, it was a great day as Pacific Gravity got back to one of their treasured traditions. Despite the quantities of homebrew that were consumed, we finished off the day with more beer than we started with! Talk about a tradition worth keeping! For those on Facebook, below are photos from the event care of President Lloyd and Carl. Hope to see you at the next Big Brew or any of the other fun PG events we have coming up. Make sure you're up-to-date with all the PG news! Sign up below to receive an email about all of our upcoming events or announcements.